Same as WhatsApp, Viber is one of the most popular instant messaging apps that allows you to send free messages, calls, photos, videos to anyone who also has Viber installed. However, unlike WhatsApp, Viber does not keep a copy of the chat history on the server or phone. Many people now use Viber quite a lot on Android, and and the history of the messages means a lot for them. What if you mistakenly hit the clear data button on Viber app? How to quickly restore deleted Viber messages on Android phones? Gihosoft Free Android Data Recovery is a professional tool that users recover deleted Viber messages on Android. 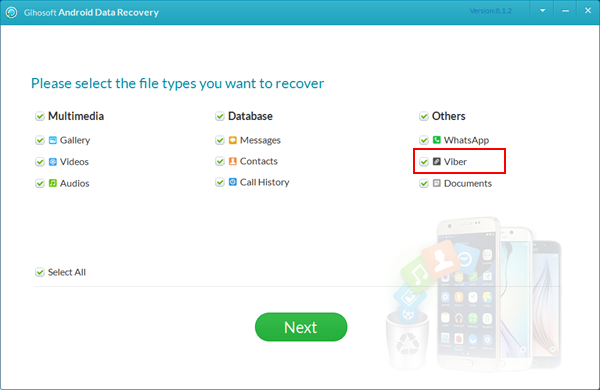 With it, you can easily recover lost Viber data, including texts, photos, contacts, call history, voice, videos, audios and more. The freeware works for all popular Android devices, such as Samsung Galaxy S10/S10+, S9/S9+, S8/S8 +, Huawei P30/P30 Pro, P20/P20 Pro, HTC U12/U12+, LG G7 ThinQ, Google Pixel 3/3XL, Motorola Moto G7, etc. Step 1. Install the Android Viber Recovery tool on your PC and launch it. Select “Viber” from the listed file types and click “Next”. Step 2. Now connect your Android phone to the PC via USB cable. Once the device is detected by the recovery tool, click “Start” to scan lost Viber data. Step 3. After that, preview the recoverable Viber data in the scan result. Select those you want and click “Recover” to save them on your computer. 1. Backup Viber Messages on Android via Email. Turn on Viber app on your Android phone, select “More Options” > “Settings” > “Calls and messages” > “Email message history”. Once the backup file is created, send it to yourself or any other email. The backed up history cannot be restored onto your Android device. You can only sign into the email account to download the backup file. 2. Backup Viber using Android Viber Transfer. Backuptrans Android Viber Transfer provides a convenient way to backup and restores your Android Viber messages on the computer. Just connect your Android phone to a computer and run this Android Viber Transfer software. All your Viber chat messages with attachments like pictures, videos, audios can be backed up and restored easily. If you use WhatsApp often than Viber and delete important conversations accidentally, please refer to WhatsApp Data Recovery for Android. How to Recover Deleted Call Logs/History from Android Phone for Free?